A good, longtime friend commissioned me to make him a quilt for his living room. We went back and forth in the early concept stages, because he wanted avant-garde but didn't really have specifics within that; so I began sending him batches of some of the images, quilts, and color concepts that most inspired me within that range of aesthetic, and he wrote back with yeses, nos, love the color, hate the design, hate the color, feels unbalanced, etc., until I felt like I had a good grasp of what he was looking for in the final product. I took it as a personal creative challenge, and approached it as something entirely improvised. Improvisation, however, still needs to have some intention behind it. I started with a rough log cabin idea, building out from what I thought might be the center, building side on side on side outward, with a lot of white space throughout. We we striving for balance throughout, nothing too lopsided over the entire design. I'm not a big sketcher or pre-planner when it comes to true improv piecing, so this grew and took on new corners as it went. There is an important central design element, though. It is a single cut of fabric depicting a large-scale Japanese warrior, wielding sword and with a bright purple band tied around his head. His expression is fierce. We knew we wanted reds and other bright colors, nothing too murky and especially nothing in the yellow family. This fabric was one of the oldest things in my stash, something I'd had since my freshman year of college, the same year I met John, and had refused to ever cut, unsure what I would use it for. This is the fabric-lover's curse, keeping something so long, scared to cut into it for fear of ruining or wasting something so dear or so pretty. I received this cut of fabric as a gift after modeling (hilariously) in a Japanese kimono fashion show, hours towards my community involvement during that first year in college. It held lovely memories, but it was collecting dust and outwearing its welcome folded in my fabric stash. 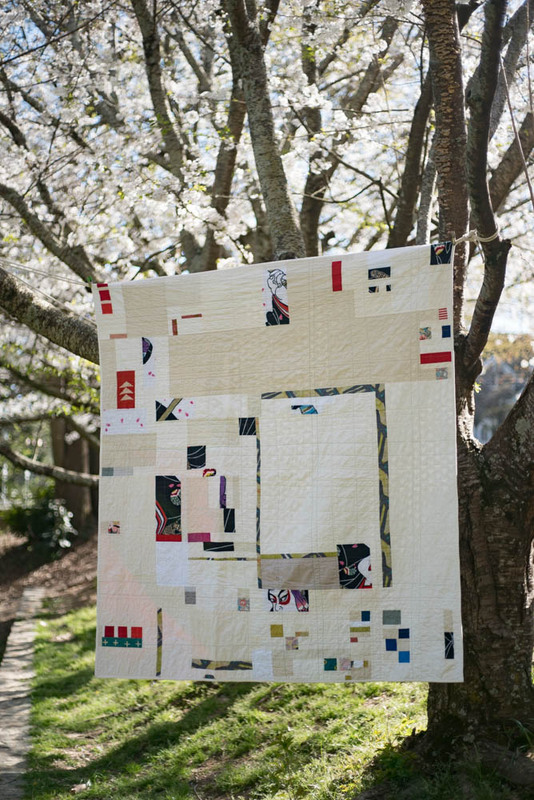 It became the central theme of the fabrics I used in this quilt, in what I hoped would be a unifying design element overall in a fractured, improvisational piece. Henceforth named Samurai. One more thing: this is my favorite quilt-back I've made so far. I LOVE IT, just as much as the face. That Essex yarn-dyed linen in black (bottom right, in back photo) adds so. much. texture.